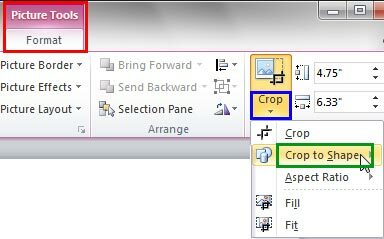 We already broadly explored Crop options in PowerPoint 2010. While you can do conventional cropping within PowerPoint, you can also decide to not crop within the typical rectangular constraints, and use another shape instead. This tutorial explains the Crop to Shape option that lets you choose non-rectangular cropping shapes for your pictures -- the results tend to look like a picture has been contained within a shape. Figure 1 below shows a conventional rectangular picture towards the left. Both the examples to the right have been created using the Crop to Shape option, that you will explore in this tutorial. Assuming you already have a picture inserted on your slide - select the picture to bring up the Picture Tools Format tab (highlighted in red within Figure 2) of the Ribbon. Activate this contextual tab by clicking on it -- locate the Size group, and click the downward pointing arrow in the Crop button (highlighted in blue within Figure 2). Within the Crop to Shape sub-gallery, select any shape from various categories -- click on any shape variant of your choice. 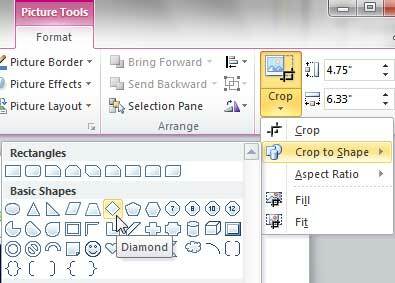 In Figure 4, you can see that the Diamond shape option within the Basic Shapes category was selected. This will crop the selected picture into the shape you have chosen. 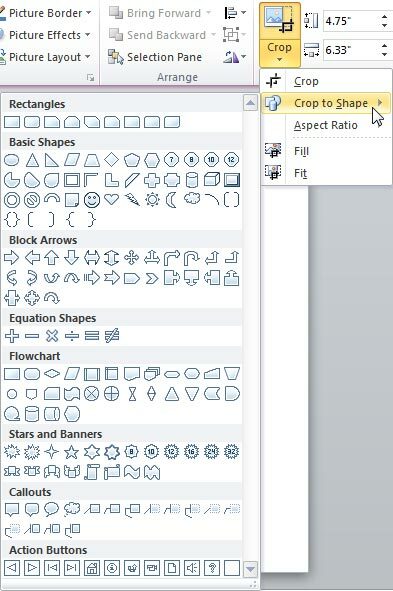 Just click away from the selected shape once you are done to deselect it. 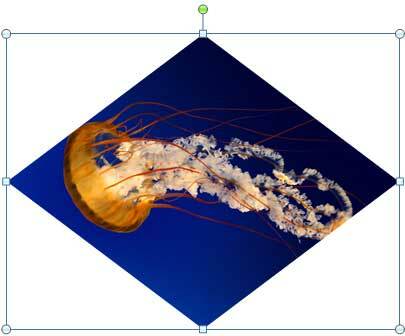 In Figure 5 you can see that the selected picture has been cropped within a Diamond shape. Note: If you apply the Crop to Shape crop option to a picture used a shape fill, you will end up changing the original shape into a new shape.